A very special event comes to The Yoga Fusion. 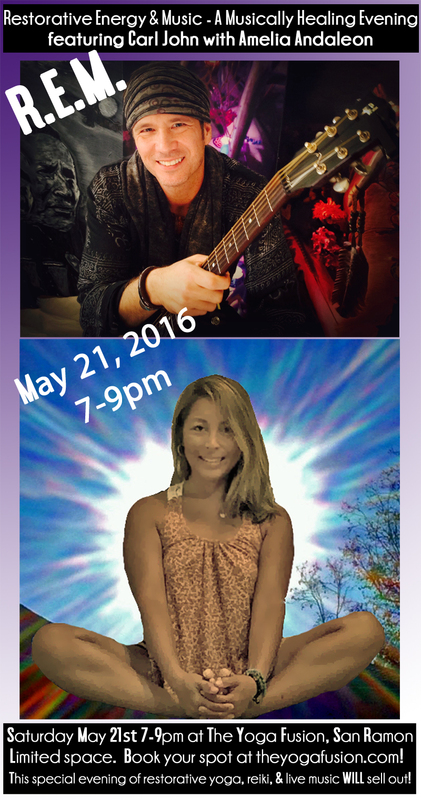 Talented live musician, healer, story-teller Carl John joins Yoga Fusion favorite Amelia Andaleon for an extraordinary evening of Music, Reiki and Restorative Yoga. CJ will bring his extraordinary blend of captivating live music and Reiki healing touch while Amelia delivers a beautiful blend and restorative Yoga, reiki and chanting. The combination is positively intoxicating, ethereal, and rejuvenating; this unique combination of music-reiki-yoga will take you to new heights of peace, ease, and pleasure. Come feel a combination of healing modalities in a workshop like none other you’ve ever experienced. Limited to 30 participants, reserve now to insure your space in this very special event. This entry was posted in healing, meditation, reiki, REM Restorative Energy and Music event with CJ and Amelia, restorative yoga, special yoga event, spirituality, the yoga fusion san ramon, yin yoga, yoga, yoga classes in san ramon, yoga fusion san ramon california, yoga in san ramon california, yoga in the east bay, yoga in the san francisco bay area, yoga workshop and tagged amelia andaleon, carl john, chanting, CJ musician, danville california, east bay, east bay yoga, evening of healing, healing, live music, peace, reiki, relaxation, rem, restorative energy music, restorative yoga, san francisco bay area, san ramon, the yoga fusion san ramon california, yoga instructor. Bookmark the permalink.